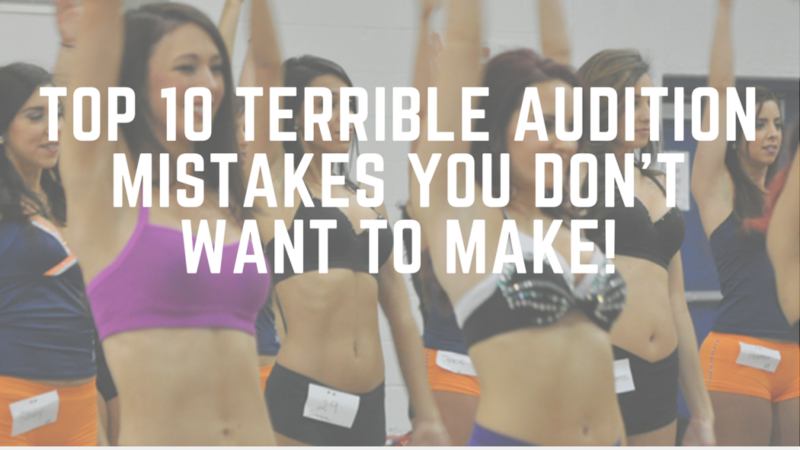 Sideline Prep | Top 10 Terrible Audition Mistakes You Don’t Want To Make! Top 10 Terrible Audition Mistakes You Don’t Want To Make! 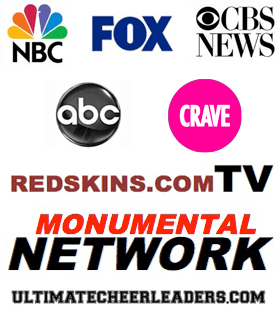 The main goal and purpose of Sideline Prep is to help our “Lovelies” feel prepared,polished, and confident for pro and semi-pro cheer and dance auditions. While our programs and services help those that we work with on so many other levels… the most desired outcome is to walk into auditions with confidence and then feel great about their overall performance as they leave. Since I have withstood 11 professional cheer auditions personally, have served as a judge for over 20 years, and am now the owner of a professional cheer “P.R.E.P.” company… I have experienced, been through, and witnessed numerous audition “fails”. Some have been recoverable… and some have been terribly horrible. However, all of them are 100% AVOIDABLE. So in this blog post, I wanted to discuss the “Top 10 Terrible Audition Mistakes” that Pro Cheer Potentials make…and also include a FREE gift to you… An Audition Success Cheat Sheet” of how to avoid these mistakes and an Audition Success “Action Sheet” to ensure you avoid them! So here’s the Top 10 List… but in no particular order. All of them are equally important and tied to one another. Until you actually have been through a professional cheerleading audition, you would not really know all the work that goes into the preparation process. A lot of people walk in and think that it will be similar to their high school or college dance or cheer team audition and then quickly realize that it is definitely not the same. You have to start researching, dancing, working out, eating right, getting fit, planning, scheduling, making appointments, etc. weeks and even months before the “big” day. When in doubt, start yesterday! … or since yesterday has already passed, start NOW! The best way to learn about the expectations, requirements, the look, dance style, and “all of the above” is to attend dance classes, prep classes, workshops, clinics and boot camps of the team that you plan to audition for. Show your face, look your best, be present, be seen, and get noticed at these events. Make a great first impression by “showing up” and showing that you are dedicated and committed to the process. But keep in mind that this could hurt you too…. Especially if you arrive late, look a mess, perform horribly, talk too much, etc. So make sure you are your “best you” when you are in the presence of others from the cheer/dance organization. Show them why they should want you on their team! Now just as a reminder, and I know this goes without saying, but when you arrive at these events be sure to give equal respect to everyone you meet and be friendly.You need to make sure that you are friendly, polite, and kind to everyone you come in contact with. Don’t assume that the person opening the door or the person behind the registration table is not important. Make sure that you are your “best you” and that you’re friendly to everyone. People talk. Word gets around. Research? Research? What do I need to research? Don’t I just need to perform and look my best? No… actually, there’s so much more to the process. You have to look at an audition as a job interview. Because, in actuality… it is. When you make the team, you will likely become a 1099/contractor/part-time employee of that team, in most cases. If you were applying for a new job, wouldn’t you research the company, its mission/vision, the job requirements, etc. of the company BEFORE the interview? Of course you would! (I hope.) Well, you have to do the same BEFORE pro cheer auditions too. Time Commitment for the Audition Process & and Making the Team (Schedules for Practices, Games, Appearances, etc.) – Can You Meet these Commitments? “The Look” of the team, Etc. Etc. Etc. Let me put it to you this way… as part of our Sideline P.R.E.P. virtual prep session, there’s a list of over 100 items to research!! Yes 100+! submission and be sure to submit the best picture possible. In most cases, a professional picture is NOT required, but it definitely does not hurt! Below is an example of a great picture to submit… But be sure you know what size picture it should be, what you should be wearing, if you can submit a collage, etc. and interview. This is your time to tell your story, to shine and show the judges that you are intelligent, witty, and fun! Let me underscore this a bit more… as part of our Sideline Interview virtual training, there’s a list of over 120 potential interview questions that myself and our Coaches have either been asked or have asked candidates as judges. You MUST prepare for anything that might be thrown at you!! Alright… we’re half way there… let’s move to #5. 5. Being Late for Workshops, Prep Classes, Auditions, Interviews, etc. and can’t make it to events on time, what are you telling the Coaches and Directors? This is a STRONG indicator that you could be a “problem child” during the season. Punctuality, just like with any job, is imperative. Plus if you arrive early, it gives you more time to polish your look, stretch, practice your routines, and mingle. want to stand out to the judges. There is definitely a fine line here. When you attend prep classes or watch videos, try to mimic those who look confident and who are nailing the style of the dance. Find the strengths in those dancing around you and add their style to your repertoire. It’s okay to borrow… and make it your own! You also need to keep in mind that having “the look” is not just about your hair or your make up or your audition outfit or dance shoes. It’s also about your overall fitness level, “tone-ness” (that’s definitely not a word but you know what I mean! ), stamina, and physique. So you need to get fit, get in shape, and get “fab.”And most importantly it’s about how you carry yourself, your poise, and your overall confidence during the audition process. classes as you can, in general (this obviously includes pro cheer prep classes and workshops… see #2 above!) The more that you dance, the easier it will be for you to pick up the choreography during auditions. I’m not sure if it is nervousness for just a lack of knowledge, but many ladies do not make eye contact with the judges while they are performing during various rounds of the audition process. This is a HUGE mistake. During auditions you definitely want to attempt to “connect” with the judges… You can do this by making eye contact and smiling at them. If looking into their eyes will make you too nervous, look at one of their ears or the top of their head… LOL! This may seem like something kind of small, but it really does make an impression. If there are mirrors behind the judges, try really hard to NOT look at yourself in the mirror. You already know that you look fabulous… so focus on the judges instead! Perform and connect with them! I get it, I get it. We all think that if we execute the routine with no mistakes whatsoever, then we will definitely advanced to the next round. But getting the routine right is more than just about hitting the moves correctly. It’s ALSO about performing the dance, connecting with the audience, having fun, and showingthem that you can fit in the with current team. Yes, you want to execute the dance correctly. But most judges understand that you will make a mistake. So it’s just as important to recover from your mistakes quickly, jump back into the routine, and just perform your heart out. Have fun! As I discussed in number six above, part of your overall look is the confidence that you exude during the audition process. This confidence comes out in how you walk, how you stand, how you talk, and definitely how you perform. If you ensure that you do not make the above audition mistakes and if you are properly prepared for auditions, you will walk in with CONFIDENCE. This confidence will help you preform your best and leave feeling great!! If you are still struggling in this area some, practice positive self-talk, visualization, affirmations, etc. Now, on the flip side… over confidence can hurt you too. You don’t want to come across as cocky, conceited, or entitled. You also don’t want this confidence to make you feel like you don’t need to properly prepare for auditions. EVERYONE has something to improve!! So… if you’re still reading this post RIGHT NOW, then you’re in a unique position to catch wind of these mistakes and uncover an approach to AVOID the mistakes before you walk into prep classes or auditions, and in doing so, increase your confidence going into auditions and also potentially claim your spot on a pro or semi-pro dance team. So chances are that even if your “competition” already knows some of this information, you can gain a competitive advantage by developing a plan of action to avoid the “Top 10 Terrible Audition Mistakes” using the strategies that I’m about to share with you. You can take steps to be proactive with getting prepared, polished, and confident going into your big audition. But this is the KEY point… you have to take the steps to avoid these mistakes; meaning you have to TAKE ACTION!! Reading this is not enough. You must act on it! Keep reading . . . now that you know the Top 10 Terrible Audition Mistakes, I’ve created a detailed, FREE Audition Success Cheat Sheet and Action Sheet to help you with your first (or next!) audition. My wish for you is to sidestep the countless traps and mistakes that make most auditions epic disasters, and instead learn how to “perform like a pro”. I’ve gone through 11 successful pro cheer auditions and I’ve been helping others “go pro” for almost a decade now and I’ve seen MANY mistakes along the way. You don’t need to make the same mistakes! I created a FREE gift for you… An Audition Success Cheat Sheet” of how to avoid these mistakes and an Audition Success “Action Sheet” to ensure you avoid them! Top 10 Tips to Put into Practice at Your Next Audition Our Japanese Lovely’s Success Story!